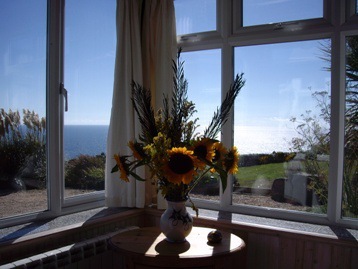 Seabreeze Studio is a self-catering apartment located on the most southerly cliff top point in Guernsey with panoramic sea views over to Herm, Sark, Jersey and the coast of France, but close to St Peter Port – the bus goes from just along the lane. This apartment is the ideal place to stay whilst you explore the islands. 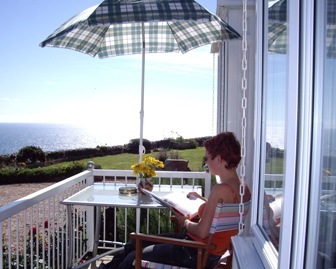 The studio is exceptionally well equipped and to sit on the small terrace with a glass of wine or a coffee just listening to the sea and watching the birds and the boats go by is magical. Guernsey’s cliff walks are famous and many people come to the island to enjoy the walking and enjoy the spectacular views, the wild flowers and birdlife. Seabreeze Studio is right at the beginning of the most stunning cliff walks. One of the delights of walks in Guernsey is that they can be rugged or flat - your choice depending on how energetic you feel, and even if you don’t walk the wild beauty of this place with its views and bracing sea air are a tonic for the soul right through the year. This really is the very best locations on the island for walkers and bird watchers or just chilling out in tranquillity with a book! If sea fishing is your passion there are buses to the harbour throughout the day and we can arrange a boat for you or hire as rod and go down below the house and fish off the rocks - our neighbour will advise you on the best time and tide. Then cook your own fish for supper? The property’s land extends down the cliff to just above sea level and you may take deckchairs or loungers onto the cliff top and picnic there too or climb down to swim off the rocks below! Two superb sandy beaches are nearby one with 240 steps to it - good for the legs! Seabreeze Studio is only 5 minutes flat walk to the bus stop and Guernsey has an excellent public bus service and we include free bus passes in April and October and free bikes are available for you to use, just help yourself to these from our garage anytime. (Not off roader bikes which are not allowed on the cliff paths).